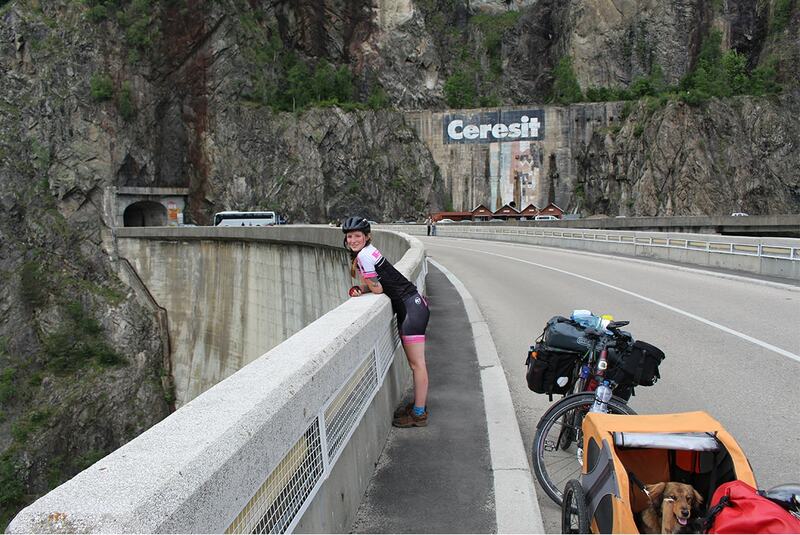 Long before we started our trip, we talked about cycling up Transfaragasan. This amazing route is claimed to be the most beautiful mountain pass in the world. After a long time waiting the moment finally arrived, but then we heard it was closed until July 1 due to snow and rock slides. We were very sad until our Warmshowers host heard that another cyclist rode it three weeks before we wanted to. We found out that the pass is actually open only to cyclists and hikers until July 1. This was the start of a trip along one of the most beautiful roads we’ve ever cycled. The Transfagarasan is a mountainous road, about 90km long and located in the heart of Romania. It runs through the Fagaras mountains (trans + Fagaras) in the Transylvanian Alps. It has sharp hairpin turns, which are a challenge for every cyclist. The road has more tunnels and viaducts than any other road in Romania. On the highest point (2134 meters) near Balea Lake is the longest (875 m/0.53miles) and highest tunnel of Romania. This tunnel is the connection between Transylvania and Walachia. The road is often closed from October through June due to snow. 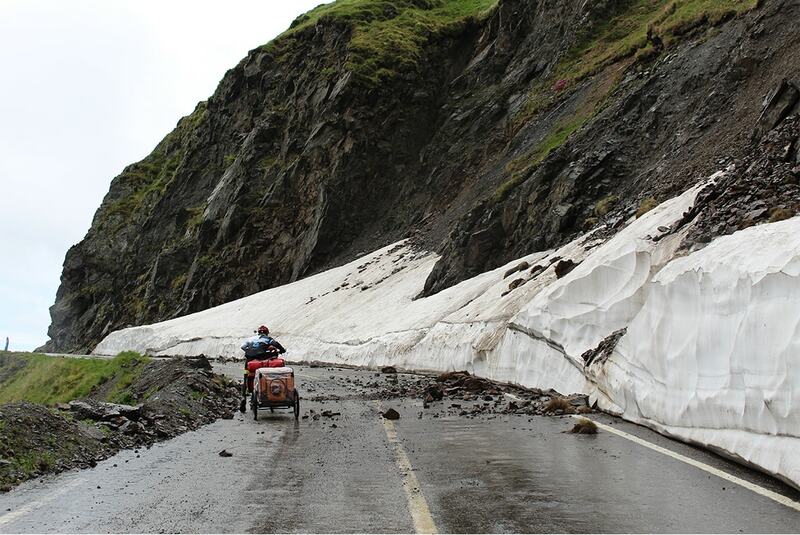 Luckily, the road is open for cyclist and hikers, but at their own risk! Since there aren’t many travelers coming to the Transfagarasan, we were the only ones on the entire route. For more than 40km, we didn’t see anyone! There was still lots of snow. The roads were rugged and many rocks had fallen on the road. These falling rocks are the reason why they close the road for cars. The Transfagarasan was built between 1970-1974 by military forces. After the 1968 invasion of Czechoslovakia by the Soviets, Nicolae Ceausescu had it built as a strategic military route to cross the mountains in case the Soviets attempted a similar move into Romania. They used 6000 tons of dynamite to clear a path for the road on the northern side of the mountains (the most spectacular) and the tunnel. Forty soldiers lost their lives during construction. A few miles beyond Curtea de Arges, where the Transfagarasan road starts, you can see a typical mountain landscape with pines and alpine meadows. The road is in bad shape here, so pay attention for holes and stones. The route starts in Bascov and follows the valley along the river Argea. After passing the highest point, it descends to Cartisoara where the road ends. 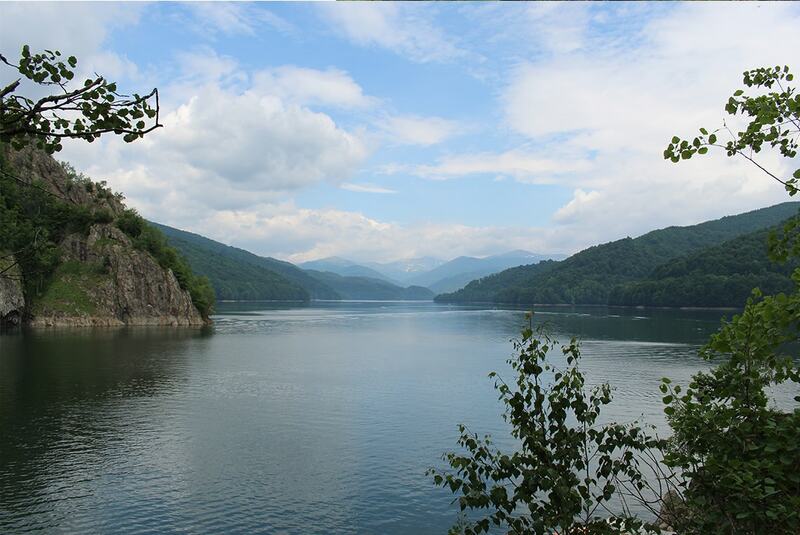 The Transfagarasan runs through the Arges River gorge. After traveling beyond the last village, Capataneni, you'll see a road sign to Poenari Castle. This castle was a property of Vlad the Impaler. Vlad earned his nickname by impaling, torturing, burning, skinning, roasting and boiling people who did things that displeased him. In this way, he kept his people in order and taught them that stealing would not be tolerated. Bram Stoker's Dracula was based on him. When you look at the mountains you can see his fortress on the top of a high and remote cliff. To reach the top you must climb 1480 stairs, but the view is certainly worth the effort. If you follow the road further north, you'll reach Vidraru Lake, a man-made reservoir retained by a dam. The dam is 165 meters high, 305 meters long and holds 465 million cubic meters of water. When the dam was completed, it ranked 5th in Europe and 9th in the world in terms of size. Near the dam the road splits. It is important to take the road that leads you over the dam (the right side), which is in much better condition. After you pass the Vidraru Dam, nature becomes more and more beautiful. This is where the real journey starts and you start climbing the Transfagarasan. We had to use our EnergyPaks wisely because we didn’t know if we’d find a place to charge them. We cycled the first day on Eco-mode. We found a restaurant that afternoon and had to stop for thunderstorms. We were able to find shelter just in time before the rain started. Since the weather wasn’t getting any better and we wanted to take our time to enjoy the amazing nature, we decided to camp. 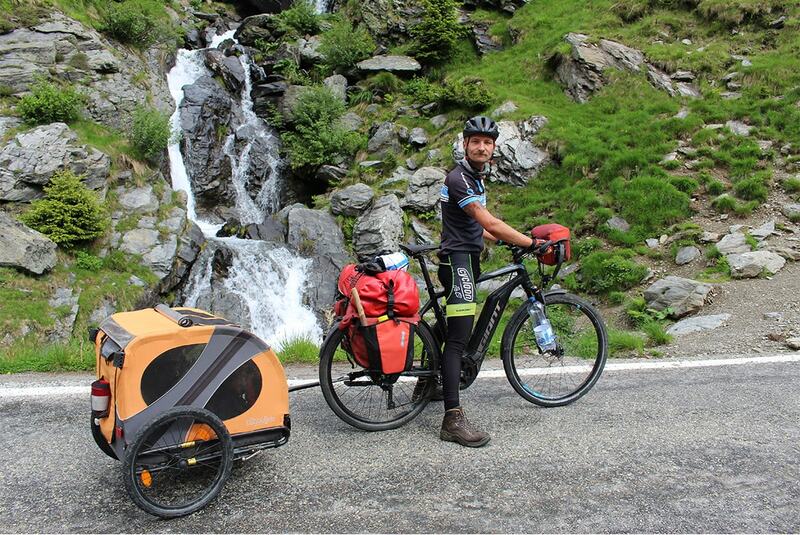 Since Romania and especially the Transfagarasan is famous for bears, it was also a lot safer to sleep near an inhabited area. We were cautious about the bears, but we still hoped to spot one during our journey. Tip! Just before the final climb to the top, there are two restaurants where you can charge your battery, have lunch and rest. Across the road, you can put up your tent for free. That night we survived without being harassed by any bears and we had a good breakfast near a very beautiful river. After packing our stuff, we continued on to the last part of the route. During the climb to the top, you will see waterfalls and other scenic spots. Eventually, when you're near the top of the road, you will see the tunnel under the Paltinu Ridge. 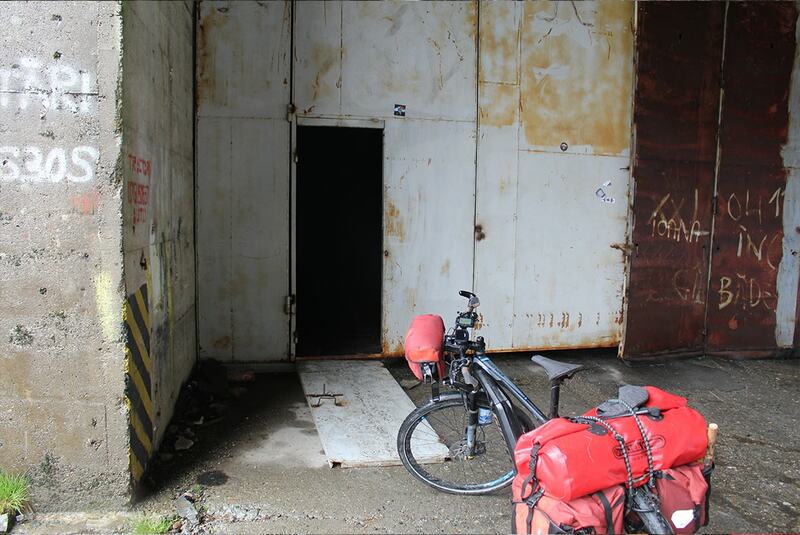 Because of the road closure, the tunnel was also still closed for vehicles, but cyclists and hikers could pass through a small door in the metal wall. We had to cycle around 1km in a pitch dark tunnel, which was pretty uncomfortable. Note! Be careful inside the tunnel. Regardless of weather outside, the road in the tunnel is always wet and can be slippery. 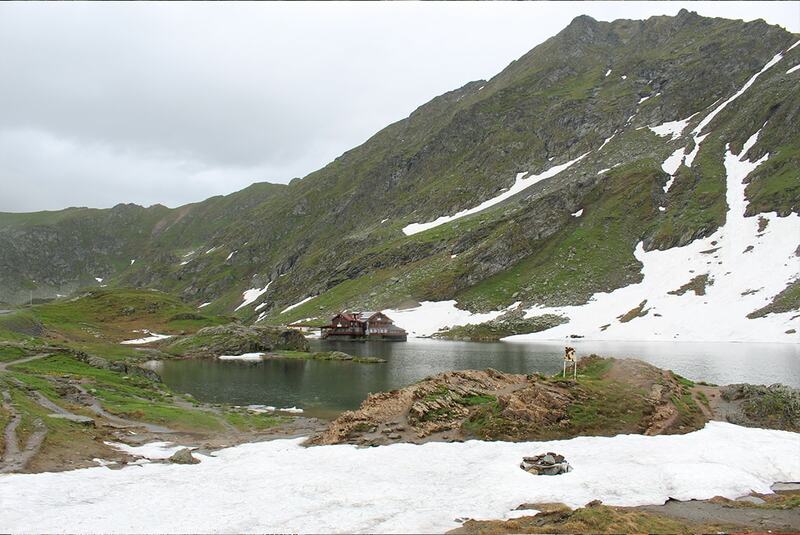 After cycling to the other end of the tunnel, we arrived at the highest point of the Transfagarasan: Lake Balea, a glacier lake with clear, icy water. It's surrounded by mountain peaks and is a beautiful sight. Every year during winter time an ice hotel is constructed with ice from the frozen lake. Since the road is closed during winter, it can only be reached by cable car from Balea Falls. Usually, the hotel remains open until it melts in April. After we did some sightseeing around Lake Balea, it was time to start our descent. When the weather is good you can see all across the valley. In the valley, you can see the almost countless hairpin turns, which you have to take before reaching the end of the road. After a few hundred meters of descending, the enjoyable views of rocks and jagged edges are replaced with dense pine forests. It was in those pine forests where we had the most incredible experience we’ve had so far on our Giant Explore E+ GTS and Liv Amiti E+ E-bikes. 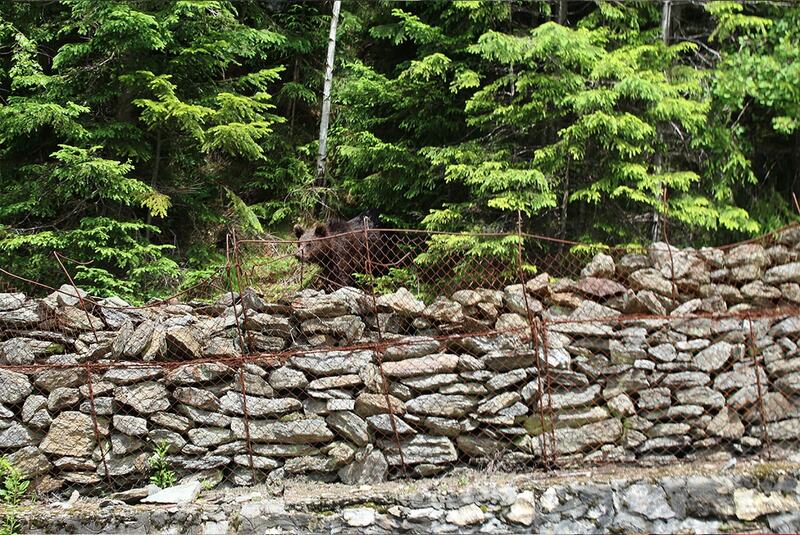 Near the end of our Transfagarasan route, we saw a bear! It was sitting there on the side of the road, just chilling and enjoying the sun. We couldn't believe our eyes and we think the bear was just as shocked to see us as we were to see him. With about 10 meters of space, we could pass him safely. We took some quick pictures from a respectful distance. Still impressed from what we had just experienced, we continued our descent. Eventually, you'll end up in Cartisoara, where you can visit the Cistercian monastery. The road ends a few miles further north. Note: When traveling in bear country, it is important to be make bears aware of you and take precautions when camping in the wilderness. Note: Sometimes the road can be open as late as November, but it has also been known to snow as late as August. It's always smart to check ahead of time on the weather and road conditions. The Transfaragasan was the highlight of our trip through Romania. 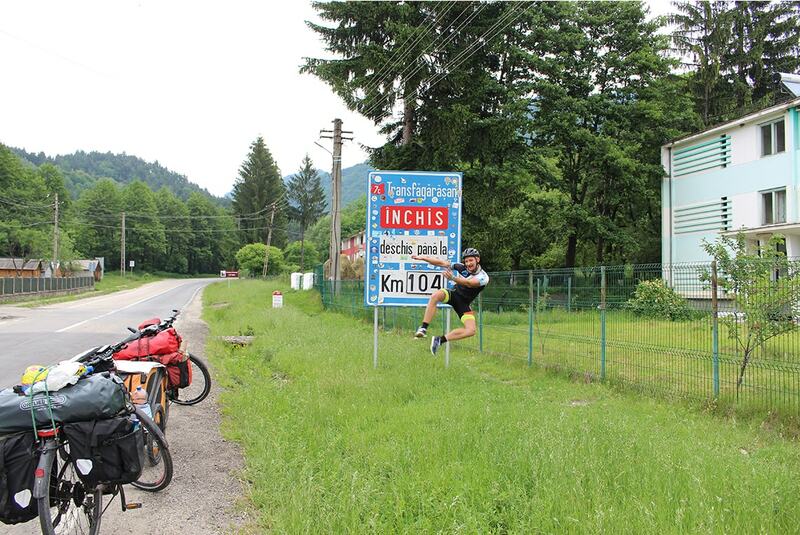 This road is a must-do for any cyclist who has the chance to visit Romania!